However, there is very little understanding about how QE Reversal may affect their institutions. 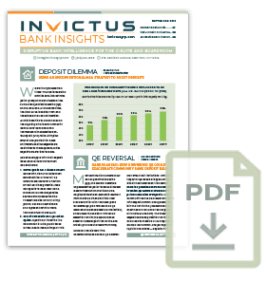 While the impact of QE Reversal is speculative since it has never been tried before, there is a plausible enough scenario in which QE Reversal could lead to a painful reduction of deposits. Many community banks are already struggling with deposit growth, and QE Reversal is in the first inning (the Fed’s balance sheet has only shrunk by about $200 billion since June 2017). The threat of deposit balances potentially shrinking could lead to massive NIM compression, stunted loan growth, and perhaps even liquidity challenges — especially if a community bank is already ‘over loaned up’. Further, it will put community banks in direct competition with large money center banks for remaining deposits. This article provides an overly simplistic summary of the QE and QE Reversal processes. It is important to discuss the mechanics, because once you understand how QE and QE Reversal work, it’s easy to see the ultimate conundrum your bank may face. Bankers can use their own judgment about how much of a threat QE Reversal presents. Invictus does not have a crystal ball and isn’t in the prediction-making business. But we are in the risk management and strategic planning business, and our strong advice to community banks is this: You need to understand what can possibly happen and plan accordingly. Depending on your situation, you may want to adjust your strategic plans over the next 3 years to play both defense and offense (QE Reversal may present a rare but massive opportunity to exploit the weaknesses of your peers, both in and out of your footprint). Now, let’s get into it…and we promise to lay this out in a way where you won’t need a PhD in macroeconomics. This illustration dramatically oversimplifies QE, leaving out some intermediate steps plus other aspects related to the supply and demand of bank deposits, the nuances of the M2 money stock, the velocity of money, and the effect of the money multiplier. JPMorgan now has $100 of fresh deposits it can deploy. It needs to keep $10 in reserves (there is a 10 percent required reserve ratio), but in theory it could lend out the remaining $90. If it did, another $90 of deposits would be created because the borrower would now have $90 of new deposits after receiving the loan proceeds. This would be on top of Bond Fund A’s $100 deposit, creating a total of $190 in new deposits in the banking system. In fact, the magic of fractional reserve banking would create approximately a 10x multiplier (using a 10 percent required ratio) on the original $100 created by the Fed to purchase the MBS, making the total possible increase in deposits approach $1,000 instead of just $100! However, JPMorgan didn’t lend out most of this $90 for several reasons. First, underwriting standards are tighter than they were pre-2008. Second, the regulatory climate post-2008 provides a number of disincentives for lending, such as higher capital requirements, the CCAR stress tests, CFPB audits, and the Liquidity Coverage Ratio (LCR). The LCR in short, basically requires the largest banks to retain enough ‘high quality liquid assets’ (HQLA) on hand to offset every $1 of possible cash outflows over the next 30 days. The less ‘core’ and the less ‘retail’ the deposit, the more likely there is an outflow. 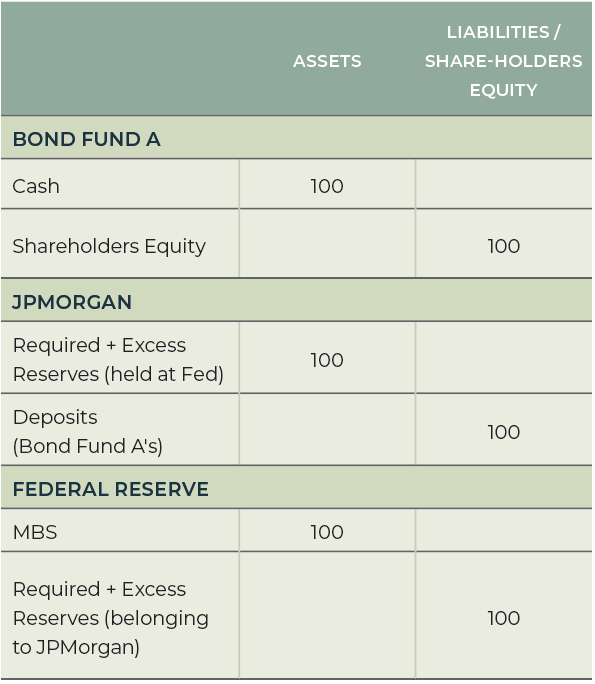 There is a complicated formula that governs this, but for the purpose of this article, the important aspect to grasp is this: JPMorgan’s $90 of excess reserves (in excess of $10 of required reserves) that are deposited at its account at the Fed counts as HQLA. So in other words, QE created much-needed HQLA for the big banks! 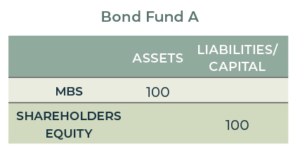 Meanwhile, according to the LCR rules, JPMorgan would only have to assume that a percentage of Bond Fund A’s deposits would be at risk so it gets plus $100 on the numerator (HQLA) and a smaller amount in the denominator (cash outflows), meaning its LCR benefited by some multiple greater than one in that single transaction. If JPMorgan loaned out the entire $90, it would not count as HQLA and the bank would be in jeopardy of not passing the LCR test. Another important aspect of this free $100 in HQLA: The Fed is paying interest to the bank! The Fed only started paying interest on excess reserves in October of 2008. When the Fed Funds rate was ridiculously low at 25 basis points during the trough of the rate cycle, the earnings stream on excess deposits didn’t add up to too much. Fast forward to today, the Fed is paying 195 basis points interest on excess reserves, and that is expected to increase as the Fed executes more rate hikes over the next 18+ months. Now the banks are earning nearly 2 percent on this risk-free money. In the relatively flat-yield curve environment we are facing, one could argue that excess reserves are the best risk/reward assets these banks hold on their balance sheet. To achieve that same liquidity benefit in a steeper curve, the bank would have to go out on the yield curve to maybe the 2-to-3-year sector while at risk for potential principal losses in a rising rate environment. So, in a nutshell, QE created a ton of benefits for the big banks. It created deposits out of thin air (the deposit market share of the top four U.S. banks increased significantly over the last 10 years). It created liquid assets that help the banks pass a liquidity stress test. And it then paid them interest on those same deposits, giving these banks a risk-free earnings stream that have a zero percent risk-weight under Basel III. Arguably the prolonged period of liquidity created by QE was better for the big banks than the bailouts were. Up until late last year, the Fed would respond to this by purchasing a new MBS, starting the cycle again. Under QE Reversal, it will simply allow the MBS to run off its balance sheet without replacing it. As a result, $100 of deposits is eliminated from the banking system. In the future the Fed intends to accelerate the process by supplementing maturities with outright securities sales. The problem with QE Reversal is that it could take the aforementioned benefits away from the big banks. The big banks benefited the most, by far, from QE. They may also feel the brunt of the pain from QE reversal. Remember, we are talking about a plan for the Fed to shrink its balance sheet by $2 trillion over the next three years! And this brings us to the real conundrum: How will the big banks respond? If the big banks are at risk of losing deposits, they won’t just watch it happen. They will take action, and they are preparing for such a scenario as we speak. One tactic in a multi-pronged strategy will almost definitely be to wage war on community bank deposits. The big banks are well- positioned to win such a war. They have a massive advantage over community banks because they are the ones that decide when deposit rates change in a given market. They have an operations, technology and analytics advantage, having spent billions of dollars in recent years to beef up electronic banking. The electronic banking presence combined with new products geared toward the next generation of customers gives them the advantage of raiding community banks’ traditional deposit hunting grounds without the need for a brick-and-mortar presence. They also have an advertising, marketing, and name recognition advantage. In a sense, all they need to do is light a match. Taking deposits away from community banks is more of a rounding error to solving this problem for the big banks. But even a small shift in market share in favor of the big banks could inflict tremendous damage — especially in a market where the deposit pie is not growing (or even shrinking). There are also many alternative theories from economists that suggest that the reduction in deposits from QE Reversal could be more than offset by a strong economy (which has the effect of creating deposits as more transactions occur). However, there is a massive headwind on deposit growth that threatens to offset and negate other positive theories (increased GDP, increased money velocity, etc.) on why deposits can grow. Either way there will be a no-holds barred battle to take market share in a world where everyone needs to keep growing. Despite the talk about QE reversal, nobody is discussing how it presents a significant threat to community banks. There’s no history for it, the lack of understanding is high, and the threat is indirect. Still, the problem is real. The threat is how the big banks would potentially respond to QE Reversal. This article is not a prediction on how this scenario will unfold, but rather a wake-up call to inform community banks that they need to prepare for the possibility. If it’s reasonably possible, then community banks should be at least talking about it, making contingency plans and even devising an offensive strategy to gain an advantage (there are always winners and losers).